FILE - Commuters ride a train during rush hour on Southeast Asia's first light rail transit network, which is 29-years-old, in Manila, Oct. 10, 2013. The Philippines is about to spend $169 billion on infrastructure, including railways and an airport terminal. Officials in the Philippines, one of Asia’s fastest growing economies, are planning a series of economic stimulus measures in 2018 to ease poverty and compensate for a lag in foreign investment. Manila is building $169 billion in infrastructure, such as railways and an airport terminal, while toying with legal changes that would let foreigners own larger shares of localized businesses. FILE - Philippines' President Rodrigo Duterte gestures during a news conference on the sidelines of the Association of South East Asian Nations summit in Pasay, metro Manila, Philippines, Nov. 14, 2017. In another major step, President Rodrigo Duterte signed into law this month the Tax Reform for Acceleration and Inclusion act. Tax revenue would pay for infrastructure and social services. The idea is to create jobs and bring in foreign investment. Those outcomes would help sustain economic growth while giving the government funds to ease poverty that afflicts about a quarter of the population of 102 million. “As the country builds for the future, there is the developing (of) social capital,” said Jonathan Ravelas, chief market strategist with Banco de Oro UniBank in Metro Manila. 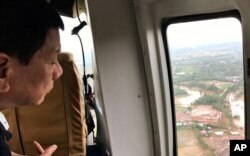 FILE - Philippine President Rodrigo Duterte looks at damage after Tropical Storm Kai-Tak hit the island province of Biliran, central Philippines, Dec. 18, 2017. The World Bank forecasts 6.7 percent growth in the Philippine economy this year followed by 6.8 percent in 2018 and 2019. Much of the growth comes from overseas remittances, a boom in call-center jobs and consumption. A cornerstone of Duterte’s economic policies is the “Build, Build, Build” program to replace decayed infrastructure through 2022 by adding the likes of railways and expressways. By 2019, a small airport three hours north of Manila will open a new terminal to ease congestion in the capital, for example. Officials hope new infrastructure will entice foreign factory investment that’s now deterred in part by transportation delays. Foreign investment makes up less than 3 percent of the economy now, lagging Asian peers such as South Korea, Taiwan and Vietnam. The tax law signed by Duterte on December 19 is expected to generate $1.8 billion in revenues in its first year. It exempts tax payments for people earning less than the equivalent of $5,005 per year while shifting payment burdens to wealthier people and vehicle owners. Congress received a bill in 2016 that would lower corporate taxes by 2 percentage points per year until they drop from today’s 30 percent, among Southeast Asia’s highest, to 20 percent. “I think the way they are going about overhauling the tax code is clearly something that is somewhat path-breaking,” said Rahul Bajoria, a regional economist with Barclays in Singapore. The government is also eyeing monetary policy changes to keep inflation in check, economists believe. 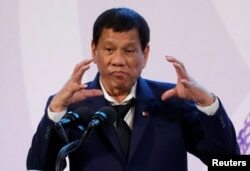 And in November Duterte told the National Economic and Development Authority Board to work on easing restrictions on foreign participation in certain industries where ownership is restricted. Foreign companies, a potential provider of factory jobs for Filipinos, have held back investments because of those restrictions. The government aims to cut poverty from 26 percent to 17 percent by 2020, according to the Ministry of Finance. But snags in the proposed economic measures could limit the jobs or funding needed to reach that goal, some fear. Timelines for new infrastructure, which is paid in part by foreign aid, is catching attention now given the country’s budget deficit, Ravelas said. “What people are looking at now is how fast they are going to push the spending,” he said. Infrastructure spending has grown from 5 percent of GDP in 2016 to about 7.45 percent now because of the surge in infrastructure construction. But that program contributed to a 234.9 billion peso ($4.7 billion) budget deficit in the first 10 months of this year, 9 percent more than in the same period of 2016. Economists still say Duterte is doing more than previous presidents to overhaul the economy and reduce poverty. 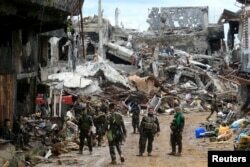 But past Philippine presidents have tried the same, particularly with infrastructure spending and tax reform, with little to show, said Renato Reyes, secretary general of the Bagong Alyansang Makabaya alliance of left-wing Philippine organizations. His alliance advocates land reform instead of the government’s “neoliberal” policies. “Previous presidents have had their own versions of the same economic stimulus programs, which did not really raise the livelihood of the ordinary folks, but it did contribute to making economic statistics look a little better,” Reyes said.